I’ve tested lightweight racing bikes that had so much bottom bracket flex that I kept looking at the rear tire to see if it was flat. I’ve tested Di2-equipped bikes where the whole frame would shudder when I shifted the rear derailleur under load. There were others that couldn’t hold in a straight line and some that would put up a fight in every turn in a criterium race. Several had handling so bad that I wouldn’t trust going downhill and others that were so heavy that it made climbing a real challenge. So what’s changed? I think manufacturers finally figured out how to design and build a carbon bicycle. For example, when road disc brakes first came out, manufacturers just modified the lower part of the fork to accept a caliper. These first bikes had horrible braking characteristics. The forks would flex inward feeling as if they would fold underneath the frame. A fork that is designed for a disc brake needs to be engineered completely different than a rim-based brake caliper. The forces applied to the fork under braking load are completely different to rim brake. I am happy to see that starting in 2016, many manufacturers have designed a special purpose road disc fork. The first bike that I tested with a special purpose fork was the BH G7 disc. The front fork on this bike is rock-solid! Bikes change from year to year and mostly for the better. This is great news for the consumer since there are more options of higher quality and great pricing. Over the last several years, I have seen quality increase while prices decrease. Thus more choices, more options and more value. 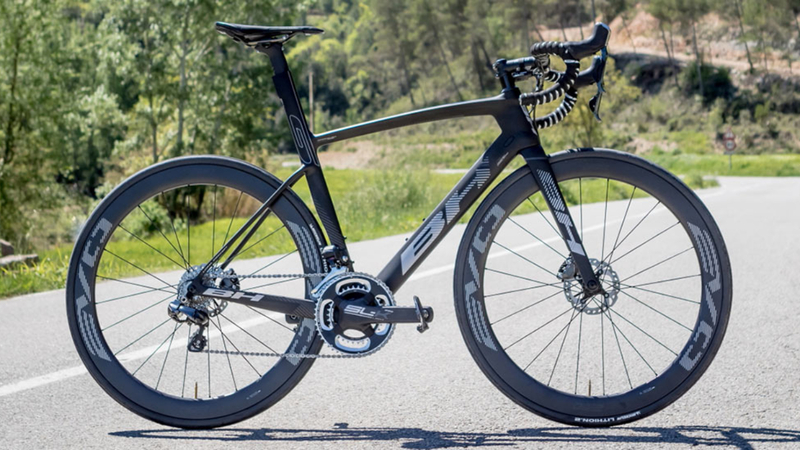 My initial impressions of the BH G7 is a rock-solid, stiff, compliant aero road bike that does everything well. The G7 Disc’s steering is quick, lively, but not to the point of being out of control. The G7 Disc makes for a great handling crit bike. It goes where you point it and gets there fairly quickly. So far I have ‘put the hammer down’ on this bike and have experienced absolutely NO bottom bracket flex, NO rear end flex nor any fork flex. I am impressed. 1. Up hills – Sitting down as well as standing up on hills as much as 17% gradient. When seated, my weight is rearward and the steering is very light. When transitioning to standing, I start rocking the bike without giving much input to the steering. Bike stays straight and perfectly under control. Because the bike is stiff, hills are a breeze. For rollers, I just keep the power on and since there is not much loss of power through the drivetrain, the bike pushes easily up and over. 2. Down hills – Some bikes are very quirky going downhill. Going up a 17% grade hill means, at some point, you have to go back down, and going back down a 14-17% grade hill, the speeds are upward of 81 kph. You want a bike that is stable, no shimmying and no shaking. Cresting the top of any hill, id clamp the downtube with my knees and hold on for a very stable and predictable journey back to the bottom. 3. Flats – I have been on other bikes that seemed to have a decided top speed regardless of how much more power you put into the pedals. There is none of that with this bike. The harder you push on the pedals, the faster you go! The advantage of having aero-shaped tubing is that a head wind isn’t much of a factor either. The G7 Disc slices right through it. BH did a nice job marrying the best qualities of a lightweight road bike and aero road bike. The G7 Disc fits right in-between giving it climbing ability/agility but without sacrificing the speed of an aero bike. 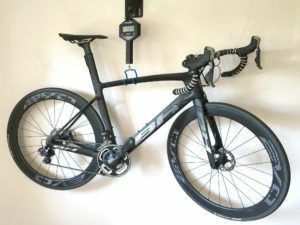 Are there faster aero road bikes? Sure, but they are more difficult to climb with. Are there faster climbers, yes as well, but climbing bikes sacrifice speed due to their non-aero fat tubes. The G7 Disc fits right in the middle and does both climbing and aero very well.